All Documents, Images, Audio&Video files, Emails, Archiv files - up to 550 filetypes are supported. 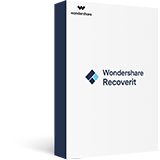 What do I get with Wondershare Recoverit Free? The Recoverit Free version has all the features of the Recoverit Pro version, but the total size of the recoverable files is capped at 100MB (Windows Version). There is no limit for the Recoverit Pro version. You can recover lost data even when computer operating system crashed, recover data when Windows/Mac OS X system is unable to launch even the computer won't start up. Wondershare Recoverit with WinPE Bootable Disk/Mac Bootable Media is designed for recovering data due to any bootable problems and operating system crash. USB boot drive is the process of using a USB storage device to boot or start a computer's operating system. It enables computer hardware to use a USB storage stick to get all essential system booting information and files rather than the standard/native hard disk or the CD drive. How to use Bootable Toolkit to recover lost data? Step1: Create WinPE bootable USB or CD/DVD. Step2: Connect the bootable media to your crashed computer. Step3: Set your computer to boot from USB or CD/DVD. Step4: Restart your computer after changed your computer boot sequence. Step5: Running Wondershare Data Recovery Pro from WinPE bootable disk to recover your lost data. You can check out this page to learn "how to recover data from crashed computer with WinPE bootable media".